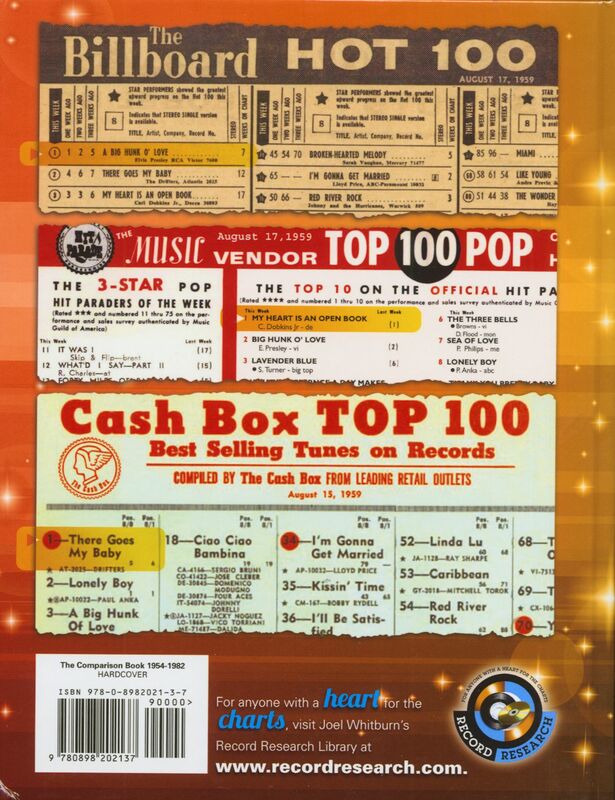 Billboard, Cash Box and Record World were America's top three weekly music trade magazines devoted to a wide range of singles and albums charts, reviews and music industry news. Billboard was always considered the granddaddy and continues today as the leading authority of the American music charts. Cash Box provided stiff competition in the 1960s and Record World in the 1970s; however, the well-established Billboard maintained their lead at the top. From 1954-1982, each published weekly pop singles charts. It was the golden age of the 45rpm record featuring the evolution of rock and roll music into the mainstream of pop culture, ushered on to the airwaves by local disc jockeys with big personalities and sometimes more fame than the artists they played. Although I have favorite songs and artists across all genres, spanning recorded music's history, this era on the pop charts claims the majority of my favorites. 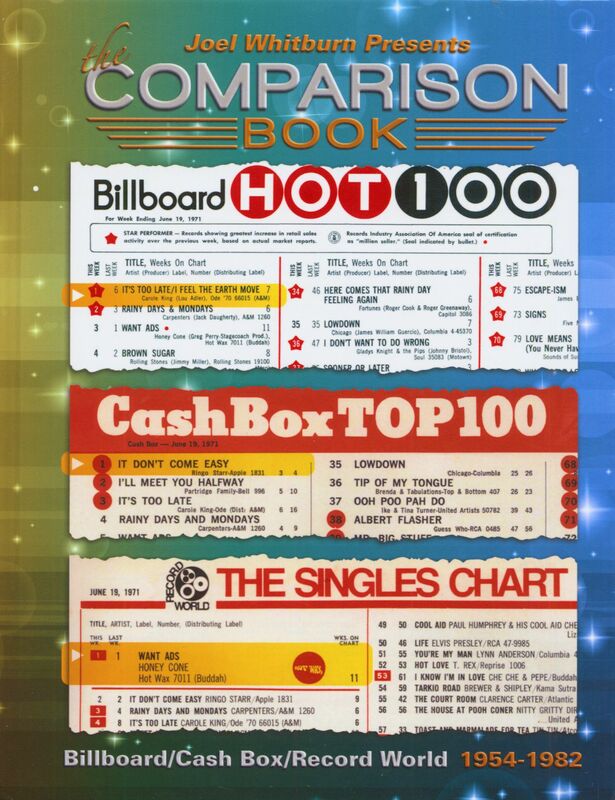 So, following the completion of Cash Box's Pop Hits and Looking Ahead books, I found that I was constantly comparing chart data from these books with my research of the charts of Record World (earlier known as Music Vendor) in my Hit Records and 101-150 books. 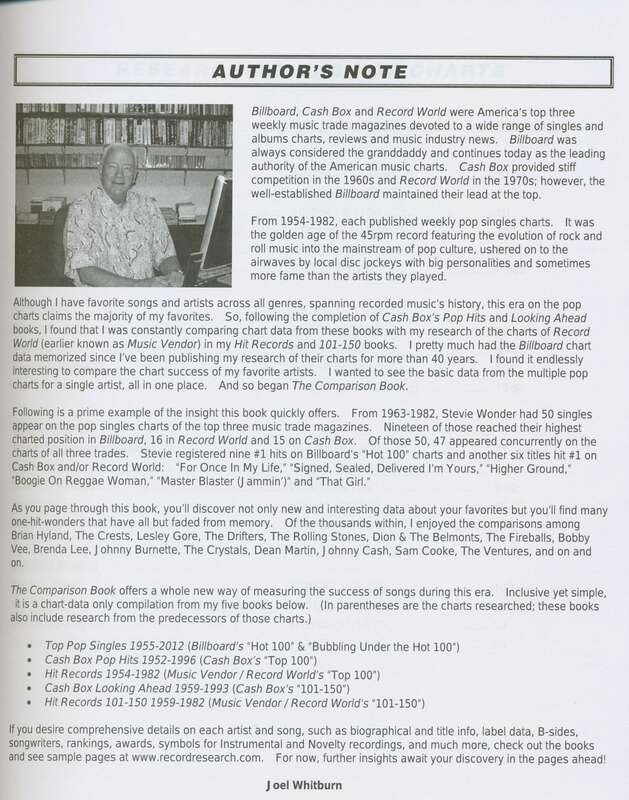 I pretty much had the Billboard chart data memorized since I've been publishing my research of their charts for more than 40 years. I found it endlessly interesting to compare the chart success of my favorite artists. I wanted to see the basic data from the multiple pop charts for a single artist, all in one place. And so began The Comparison Book. As you page through this book, you'll discover not only new and interesting data about your favorites but you'll find many one-hit-wonders that have all but faded from memory. Of the thousands within, I enjoyed the comparisons among Brian Hyland, The Crests, Lesley Gore, The Drifters, The Rolling Stones, Dion & The Belmonts, The Fireballs, Bobby Vee, Brenda Lee, J ohnny Burnette, The Crystals, Dean Martin, J ohnny Cash, Sam Cooke, The Ventures, and on and on. 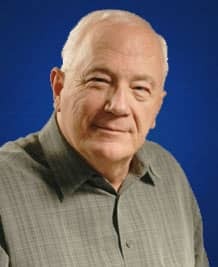 If you desire comprehensive details on each artist and song, such as biographical and title info, label data, B-sides, songwriters, rankings, awards, symbols for Instrumental and Novelty recordings, and much more, check out the books and see sample pages at www.recordresearch.com. For now, further insights await your discovery in the pages ahead! Customer evaluation for "The Comparison Book - Billboard, Cash Box, Record World 1954-1982"